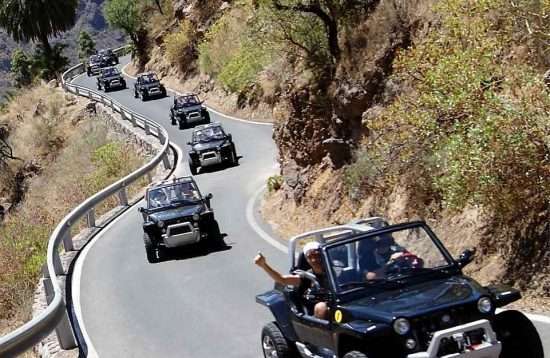 Would you like to get to know Gran Canaria from its unspoilt side during a jeep safari? We can take you across the island, over winding roads; over hill and dale to places you would not come past otherwise. When you are being picked up in the morning, one of these purist vehicles will stand in front of your hotel reception. If you are staying in Playa del Ingles or Maspalomas, the jeep will quickly bring you to the meeting point. From Puerto Rico or Las Palmas de Gran Canaria instead you will first take a ride towards the meeting point over the highway sitting in the backside of the jeep with your hair blowing in the wind. After this experience you will already know what to expect. And the curiosity and anticipation increases. 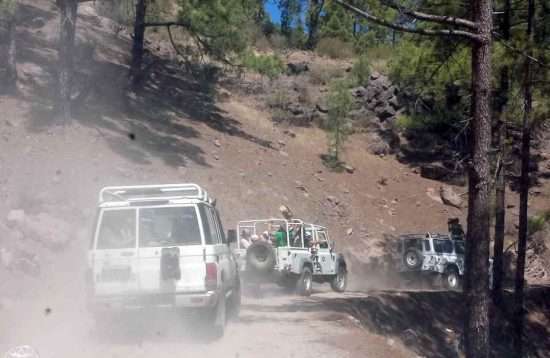 Welcome to your Jeep Safari Gran Canaria! Comfort is something entirely different! This is the first thing you will notice when you climb into the 4x4 Discovery Vehicle. But you knew that the Gran Canaria Jeep tours would be rustic. You take a seat on one of the lateral seats in the backside. Other guests are getting in the jeep too and are greeting you. That you are a sociable person now benefits you. You will quickly get into a first conversation and then the tour already starts. All the jeeps participating in this safari gather in a parking lot honking their horns while positioning in a row. Everyone is waving and the tension is rising. You will get a totally new perspective on this Jeep Tour Gran Canaria. The convoy finally sets in motion. The driver steers the rustic off-road vehicle safely through the curves. He likes to drive a little closer to the front vehicle, so that people in the different vehicles can get to know each other. When taking the curves, you always have to counteract the centrifugal force. You just notice how the fun factor tilts upwards. The cheerful chauffeur points out to the sights passing to the left and right. You pass a huge banana plantation and can see the exotic banana tree. The caravan stops for the first time. The English-speaking tour guide loudly welcomes all participants and introduces his crew and the cameraman. The latter will produce a film of today, which you can of course purchase. 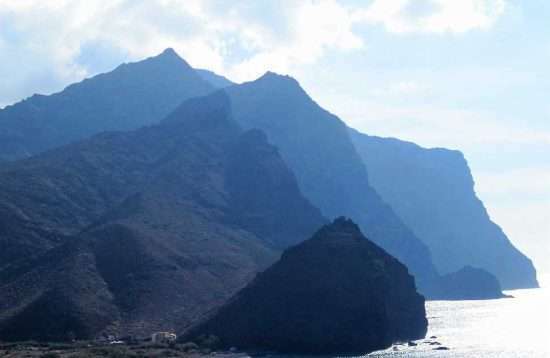 The guides’ eloquence and his knowledge of Gran Canaria and its inhabitants are really refreshing. Take a deep sip from your water bottle and adjust the duster again before moving on. Serpentine after serpentine, the Jeep Safari convoy gets higher into the stunning mountains of Gran Canaria in a wavy motion just like a snake. The canyons get deeper and the cliffs get higher and higher. After just a short while, you will suddenly turn left and go off the cozy asphalt road and continue on a really dusty track. "Thanks for the bandana, sweetheart", you’ll think and then hold on to the bars. Every single jeep now produces so much dust that you can barely see your hand in front of your eyes. 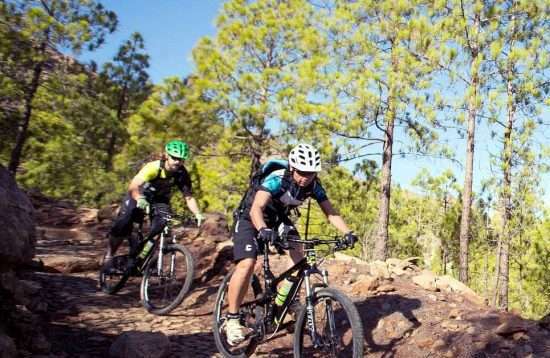 You pass through a pine forest that fascinates you, because you didn’t expect such coniferous forests in Gran Canaria. Then you finally stop the dust sinks. And you will be able to take a glance through the trees. On a clear day you will be able to see the neighbor island Teneriffe and how the highest mountain of Spain, the Teide rises above the clouds. After a last dusty bend, the Jeep Tour turns onto an asphalt road again. You have completely lost your orientation. At the same time you are overwhelmed by the new views over a deep valley, at the bottom of which you will spot some small villages. In the very middle of it all a mighty monolith is standing out and reaching high up into the sky. 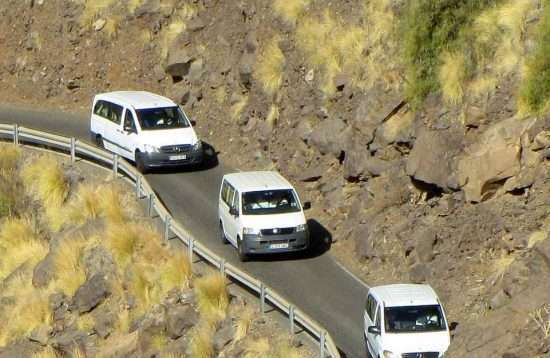 The driver explains that what you see is the Roque Bentaiga, one of the religious sites of the aborigines. After a delicious lunch and a short break, the group slowly gets on its way back. 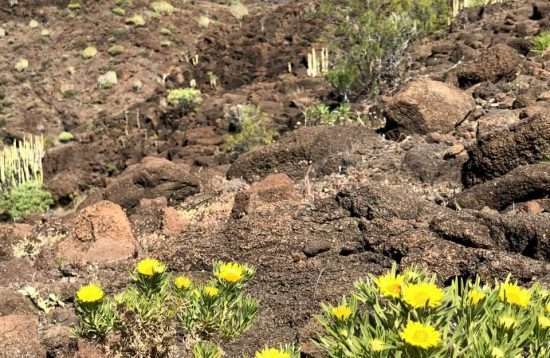 But only after you have been through San Bartolome, Fataga and the valley of the 1000 palm trees, you will get back to your starting point in Maspalomas. You are exhausted and the dust is still stuck between your toes. But you are happy and satisfied, after an absolutely exciting day. What's this? Four wheels, two seats and a four-wheel drive? A small convertible that you will be able drive yourself. With this small roadster you will follow your guide in a convoy. 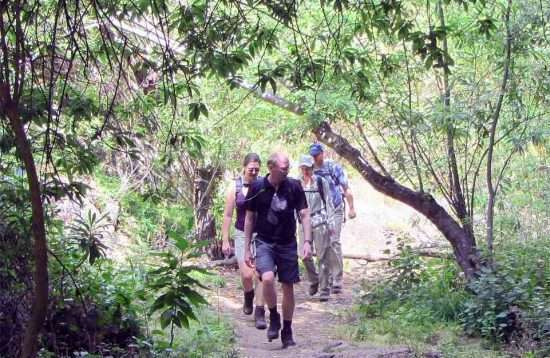 He leads you over this beautiful island and shows you seemingly undiscovered areas. You can see reservoirs, pine forests, rugged mountains and sleepy valleys. The fun factor is permanently on a high level, because this small vehicle drives fantastically and brings you quickly through each of the countless curves.